For the similar House Redoran quest, see Slay Reynel Uvirith. Kill this Telvanni sorcerer in the stronghold of Tel Uvirith. Speak to Crassius Curio to learn your next assignment. Travel to Tel Uvirith and kill Reynel Uvirith. Evidently this quest is of some importance to Crassius Curio as he requires you to be a House Father and have a stronghold that has reached at least level two before he will give it to you. 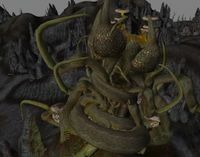 Talk to Curio in his manor in Vivec and he will ask you to kill the Telvanni sorcerer Reynel Uvirith in the stronghold at Tel Uvirith, in the Molag Amur region west of Tel Fyr. Reynel Uvirith can be found in the Tower Lower area of the stronghold, and should not prove too much of a challenge for a character that has reached this stage. Return to Crassius when Uvirith is dead to complete the quest and receive 1000 drakes as reward. You can do this quest even if you're not in the House Hlaalu. After you have killed Reynel Uvirith, just speak with Crassius Curio about Reynel Uvirith, he thanks you and gives you 1000 gold, with a journal entry for the Hlaalu Quest. 10 Crassius Curio asked me to kill Reynel Uvirith, the Telvanni Sorcerer who lives in the Telvanni Stronghold of Tel Uvirith which is in the ashlands due west of Tel Fyr. 100 Finishes quest Crassius Curio thanked me for killing Reynel Uvirith. This page was last modified on 29 August 2017, at 21:15.